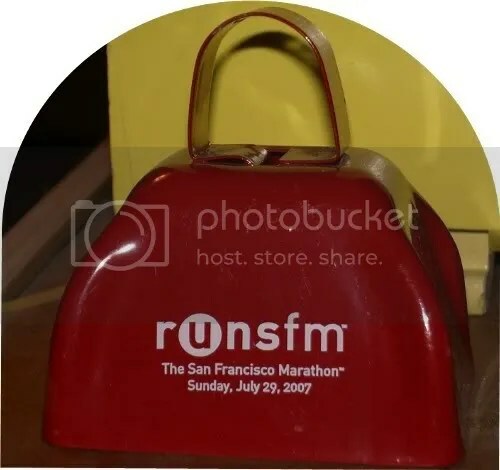 At the SF Marathon Saturn was passing out cowbells. Shiney red cowbells. Of course I took one and I’m glad I did because in the crazy ebb and flow of my life I have just decided to go to IM Wisconsin, afterall. I won’t get there until Saturday afternoon but that’s plenty of time to show up on the course Sunday morning and spend the day cheering and watching and drinking in the Ironman zeitgeist. I can hardly wait! I will have to have Laurie give me some good spectating tips – she is the master. This will be a bloggerpalooza. In addition to a bunch of racers there are a whole ton of spectator/sherpa types. I hope I have a chance to meet all of you! Just look for me near the finish line starting at about 6:30 PM. I’ll be there – glued to the action. This entry was posted in community, triathlon. Bookmark the permalink. Woo Hoo! have fun at the Moo!! Hey – that’s a noisy red purse ya got there! that is perfect! have fun and we expect a full report. Hope you enjoy it as much as I did~! I thought it was a purse, too! Have a blast! i also thought it was a purse. i’m a little sad now. hey, get a matching purse. that’s a cool idea – all races should hand out some manner of propaganda noise maker keep-sake. for the fans!